This pattern is available from theuniquesheep.com for $7.00. When Kelly asked me to come up with a design for a Christmas stocking I immediately thought of Victorian Christmases with rich fabrics and candlelight and all that stuff. With that in mind I decided on a stitch pattern that reminded me of a heavily textured brocade. I chose the garter st heel to echo the purl back ground of the stitch pattern, but if you prefer you can substitute a stockinette one for more contrast. 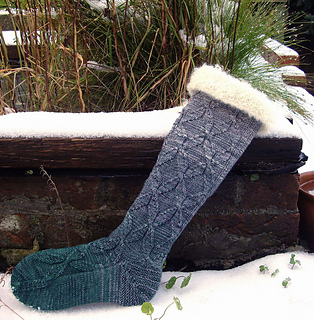 If you don’t fancy knee socks, use the larger needles and double of the yarn and make a Christmas stocking for your mantel piece.